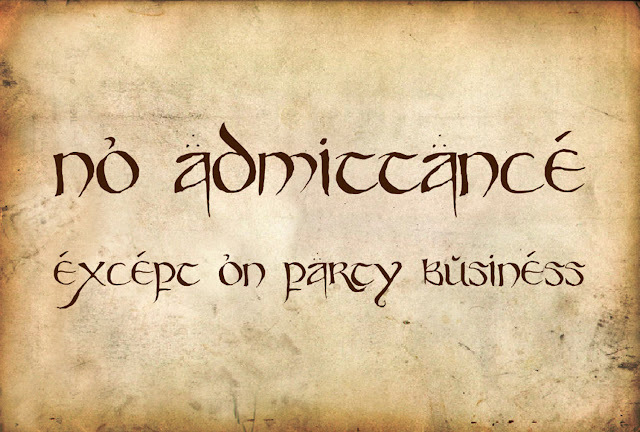 A Long-Expected Party: Happy Hobbit Day! In the Middle-earth calendar, September 22nd is a special day. For fans of J.R.R. Tolkien's fantasy masterpiece, Lord of the Rings, today is one of the most important days of the year. 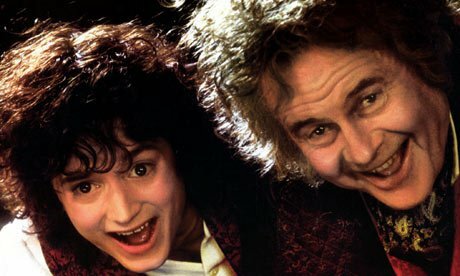 On this day, September 22nd, in Middle-earth, two heroes were born: Bilbo Baggins and Frodo Baggins. Of course, they were born on different years, Bilbo being seventy-eight years older than Frodo. "'You had better come and live here, Frodo my lad,'" said Bilbo one day, "'and then we can celebrate our birthday-parties comfortably together.'" Back in 1978, the American Tolkien Society proclaimed September 22nd as the official Hobbit Day because of Bilbo and Frodo's births. In addition, the week containing Hobbit Day is considered Tolkien Week. The first Lord of the Rings book, The Fellowship of the Ring, begins on Bilbo and Frodo's birthday known as the Long Awaited Party, or the Long-Expected Party. It fell on the year when Bilbo turned eleventy-one and Frodo turned thirty-three, both being significant years for a hobbit's life. Eleventy-one is considered a "rather curious number, and a very respectable age for a hobbit." Thirty-three was the year a hobbit came of age. Not only did this day start off the epic Middle-earth tale, but it has been the oldest celebration for Tolkienites (that's a fancy name for fans of Tolkien) to observe, even long before it was deemed an official celebration. "Bilbo Baggins called it a party, but it was really a variety of entertainments rolled into one...there were songs, dances, music, games, and, of course, food and drink. There were three official meals... There were fireworks by Gandalf." In addition, this long-expected party also began the events of the rest of the epic. Bilbo departs from the Shire after his party and leaves Frodo Bag End and all his possessions, including the One Ring. This then sends Frodo off on his anti-quest and well, the rest is Middle-earth history. "I am immensely fond of your all, and that eleventy-one years is too short a time to live among such excellent and admirable hobbits." 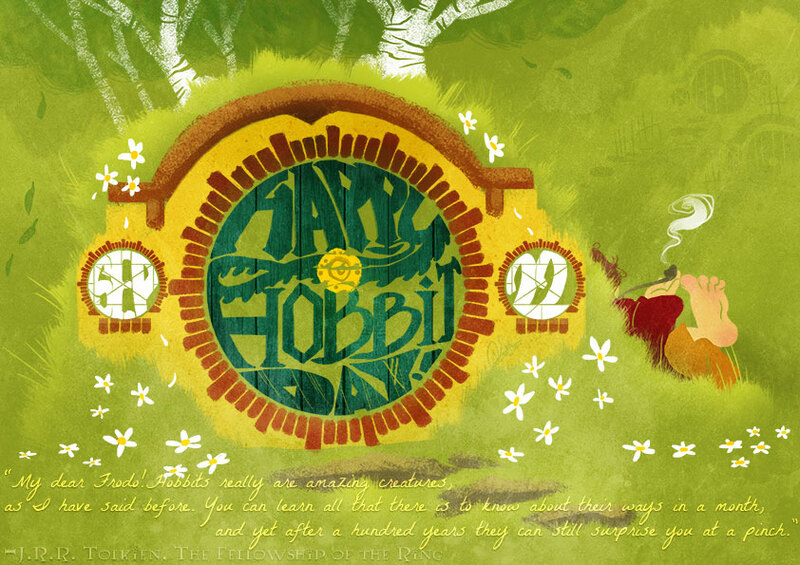 It comes as no surprise why Hobbit Day should be celebrated by fans across the world. Hobbits are very vital to the anti-quest of the story; they're the reason the Ring is destroyed and the Dark Lord Sauron is defeated. Their stout hearts, strength of will, and turn of surprises keep the mission on track to the very end. Hobbits are also what started off Tolkien's first Middle-earth book, The Hobbit, when he penned the line: "In a hole in the ground there lived a hobbit." In which, he did not even know what a hobbit was at the time. And when he did finish and publish The Hobbit, publishers (and probably fans) demanded more hobbit stories; thus, Lord of the Rings was born. Hobbits should be celebrated for their hard work and deep loyalties. And there's no better day than to appreciate hobbits, Tolkien, and the epic story that changed fantasy forever than September 22nd. But how? How can you celebrate such an important day in the literary calendar? Just like Tolkien Reading Day, you can find some time to read a little bit of Tolkien's work. Maybe you can't read an entire novel or the entire series but immerse yourself in some Tolkien of words. You can learn a little bit of Elvish--or at least how to write your name. Or listen to Tolkien read a poem in Elvish. You can dress-up like a hobbit, or at least go barefoot for the day. You can make lembas bread or other yummy hobbit recipes. You can have an impromptu party with your friends (just drag them into it, they'll love you if you give them food). You can (and should) shoot off fireworks. You can go on a quest. What are you going to do for Hobbit Day? What's your favorite thing about hobbits? All quotes are from Book I, Chapter I of The Fellowship of the Ring by J.R.R. Tolkien.